bluesman's life is like, the venues he goes to, the characters he meets, his experiences. He sends in chapters of his diary when he's ready. Who knows what adventures he will have. Greetings blues music lovers from a bright and sunny Edinburgh afternoon. I drove up from Brighton yesterday after voting in the general election. I am here starting off my 2017 summer tour. This will include gigs in Scotland and the north east of England, including Durham and Cleethorpes Blues Festivals, before heading home for a short three-day break. Following The Glastonbury Festival, a gig in Sidmouth, back up to the midlands via Shaftesbury Fringe and the N.E. (again), finishing up with a week of gigs in Edinburgh celebrating the 70 th anniversary Edinburgh Fringe Festival. I was particularly looking forward to be performing three short shows in the poetry tent at Glastonbury with my friend and performing partner Roy Hutchins. 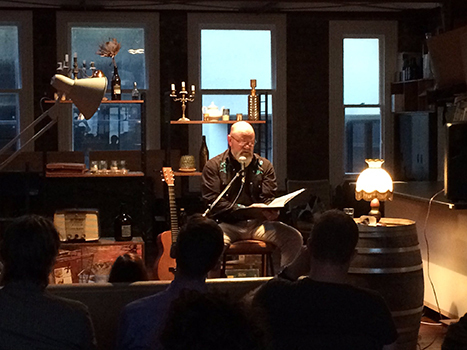 This year I am providing the musical accompaniment to some of Heathcott Williams' short poems read by Roy. After the shows we plan to chill out and generally enjoy the festival atmosphere at Worthy Farm. We will most likely be found round the fire pit outside the bar, back stage at the T+C (Theatre and Circus area), or outside the acoustic tent eating rhubarb crumble! Oh and a beer or two might figure somewhere there in the equation! 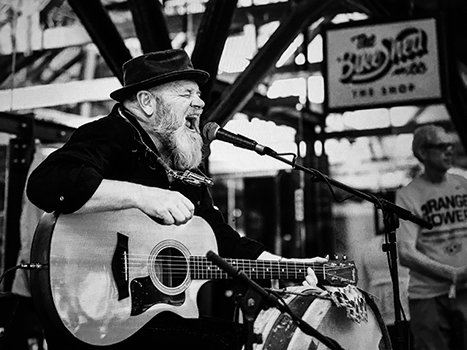 At the end of my last blog I was talking about my delight of having been booked to do a number of gigs at the Bike Shed in Shoreditch London. While out on tour in New Zealand (more of that later), I got a message from my lovely contact at the Bike Shed to say that due to financial pressures, the live music on Thursdays had been pulled. This meant that the 4 bookings I had for this year, were now cancelled. This gigging contagion continued, and I returned to hear from my agent that another gig at the back end of the summer tour had been cancelled. However, with the addition of new gigs picked up as a result of my recent appearances in London and Darlington, I am pleased to report that my gig Kama has returned to some form of balance! Sadly not the first time venues are cancelling gigs giving financial constraints as the reason in recent years. Its not just blues nights being cancelled. I have been following the story of the threatened closure of the iconic 100 Club on Oxford Street in London. Mounting overheads are threatening the survival of the club. I have commented on the closure of live venues in recent diary entries, but what is to be done? In America, some venues have caps on their rents and taxes, an acknowledgement of their cultural importance. 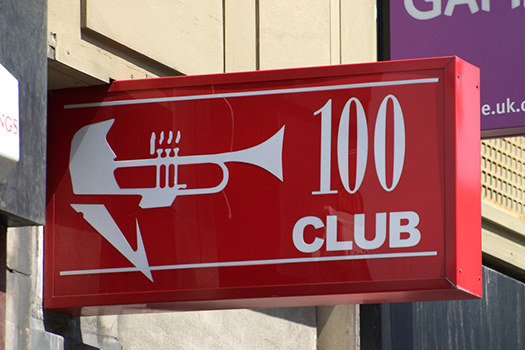 Considering the list of bands who have played at the 100 Club and its internationally reputation, could we not give it some form of heritage status and cap its rent? Without some form of financial intervention, the club owners are reporting that it could be closed by Christmas. Despite the cancellations at the Bike Shed's Thursday Club nights, I was booked to play at the Bike Shed's big London Showcase event to play a solo set and to guest with the marvelous Rough House Trio. The big independent motorcycle show was held in the marvelously atmospheric Tobacco Dock, a converted warehouse complex in Wapping. It was a great day and much fun was had by delegates and muso's alike. The bonus for me was I got to catch up with Howlin Matt, who was also booked to play. He and I have been following each other around the circuit for the last couple of years, a great muso and a great guy. A bonus for me was that I picked up a booking at another festival later in the year by someone who had seen and heard me play my solo set at the Bike Shed event. I had taken a break from working in the Brighton Fringe Festival to do the Tobacco Dock gig. I had been performing my music and story telling show in the Brighton Fringe. This show, based on stories of my Irish and English family, includes 5 songs that punctuate the different stories, which span three generations of Mckeons. Sameena Zehra, (who directs and co- wrote the show) and I are planning to work on it some more, and will be developing it further with a mind to a longer run next year at Brighton Fringe with a possible run in Edinburgh Fringe Festival in 2018. The year had started well with festival shows in both New Zealand and Australia. In New Zealand, Sameena produced 4 shows: Fiery Tongues, the spoken word polemic written by Heathcott Williams with music written and performed by myself, narrated by Roy Hutchins and performed by Sameena, Anya -Tate Manning and James Nokise. The second show was Sameena's solo show Tea With Terrorists. I performed Irish Jimmy and an hour long ' Nothing But The Blues', a collection of my favorite tracks from Heaven Bound and a few blues standards. The start of the run was not without its hurdles. On arrival in Wellington, I discovered that my trusty resonator had been damaged in transit. Something that surprised me as it always travels in a Hiscox flight case, which generally are very reliable and usually protect the instrument within, from the harsh realities of international touring. As I was to discover, the music community in Wellington are incredibly helpful and supportive, and within hours of arrival, I had been put in contact with a technician and the guitar was fixed. The next hurdle we had to overcome was that the venue I had been booked into play my two solo shows, a local popular music venue, had closed at short notice following the discovery of damage caused by a recent earthquake. The amazing team that run the Fringe in Wellington found us an alternative venue and we set out to make it into a performing space. 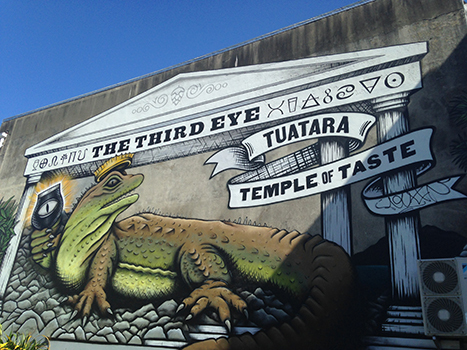 We were lucky that this upstairs space above the Third Eye Tuatara brewery and bar already had some staging. We set up a performing space (above), which included some retro 1950's and 60's lounge seating. This really worked as the audience could sit in comfort, giving the space the feel of a rather large front room. 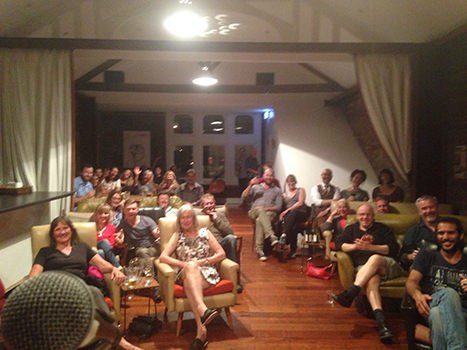 I am unknown in NZ, but word of mouth spread and by the last of three nights of Irish Jimmy we had a great house. The same pattern of attendance was repeated for ‘Nothing But The Blues'. I loved the New Zealand Fringe and the lovely team that run it. It is still relatively small and very much focused on the artists. It does not have large commercial pop up venues, relying as it does on local theatres and bars to host the very imaginative and eclectic curation. We had a couple of weeks to promote the shows before the start of the run. Sameena and I jumped into a hectic schedule of T.V. and radio interviews. Promoting is an important part of any tour. Highlights for me were an appearance on New Zealand's day- time magazine program called The Cafe. 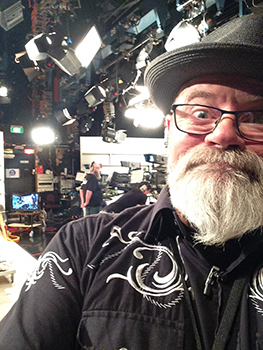 I had to fly up to Auckland for the interview, my first TV appearance. I really enjoyed myself. In addition to promoting all 4 shows we were doing on air, I got the presenter to sing a blues he had composed live on telly with me accompanying him. They also played a clip from the Silent Man video. It was fun, and much like a gig night, quite a lot of hanging around. What made it for me, was the crew who were very friendly, amazing to watch them working. It was an experience I hope to repeat again. Sameena and I did a couple of national and local radio appearances, again, great fun. The Fringe shows went well. 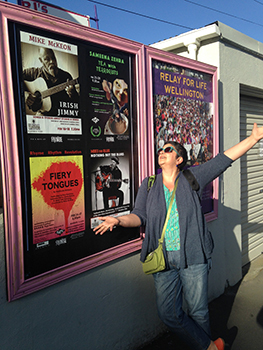 Both Sameena's Tea With Terrorists and Fiery Tongues had sold out shows, we had to put on extra shows and both won Festival Fringe awards. Fiery Tongues won the Outstanding Ensemble Performance award and Sameena won the Outstanding Performer award. After the excitement of New Zealand we moved over to Melbourne in Australia to perform in the Comedy Festival. We had a couple of weeks off, spent with family and friends, chilling out. Sameena was producer and MC of a compilation show in Melbourne called The Cult of Comedy, a show she has run and developed at Brighton and Edinburgh Fringe festivals. I opened and closed the show with some live music. The show featured acts that were in town for the festival. I am always struck by the variety of performances that we regard as comedy. I watched some amazing clowning, funny, witty political cabaret; stand up, performance poetry as well as some excellent story telling. I also was helping to promote the show by fliering, something I love doing. It's the only way I can stand on a street corner and shout at members of the public without getting arrested! We had a good run, the shows had some phenomenal line ups and the audience responses were warm. It was lovely to catch up with many of the carny folk - our festival friends. I also got to see some great shows. We had a good time in Melbourne, returned home tired but with a few days to re-cooperate before the start of the Brighton Fringe. In previous years I have struggled to find my niche in the Melbourne music world. The Blues scene there is relatively small, overshadowed by a vibrant Jazz scene. Unlike Adelaide where I have found quite a lot of work, gig - wise, in the past, I have struggled in Melbourne. Like every other town I have tried to find gigs, in the end, it's down to contacts. Two things happened in Melbourne this year. A performing buddy overheard me talking about gigging and offered to introduce me to a music friend of his. After a particularly fun afternoon of sitting in with some great local bands in a couple of venues one Sunday, in St Kilda, I had two offers of gigs. This was further consolidated by a late night, chance meeting with a bar owner friend of a friend who offered me the chance to perform a showcase at his bar. After calling in some favours and getting a crowd in, I was again offered an open invitation to return to perform. Evidence if evidence was needed that there is a lot of business done, in bars late at night at the festivals.